The kitchen is the hub of many people’s households, but safety in the kitchen is vital as there are many ways in which it can be dangerous. Whether you’re a lover of baking and cooking or someone that doesn’t spend a lot of time in their kitchen, these kitchen safety tips will be useful in helping to prevent injuries to you and your family. 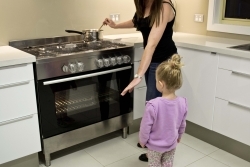 Some children enjoy helping parents out in the kitchen, but you must teach them to stay out of your way when necessary and to keep their distance from hot appliances that haven’t yet cooled down. Furthermore, pets around your feet or lounging on the floor are tripping hazards, so it’s important to make sure that they are also kept at bay. Rushing around the kitchen will almost guarantee accidents. A top kitchen safety tip is to be careful and take your time when cutting food and moving pots and pans. It’s easy to spill something in the kitchen when you’re multi-tasking and trying to tend to others. To improve safety in the kitchen it’s crucial that you clean up water, grease or oil immediately, before anyone trips and hurts themselves. Furthermore, food that is spilt in the oven and not cleaned up gives your food an unpleasant taste of smoke and charcoal, which is unhygienic and can cause illness. Keeping your oven clean is a great kitchen safety tip because if food is spilt on your oven and not cleaned up, it can burn and set fire. Furthermore, if your oven is dirty then it will often produce black smoke, which can be very hazardous for you and your family. If you need your oven cleaning and would like a free quote, call us on 0800 840 7127, or complete our online form. Make sure you educate yourself on how to slice and chop food properly with knives so that you don’t injure yourself. 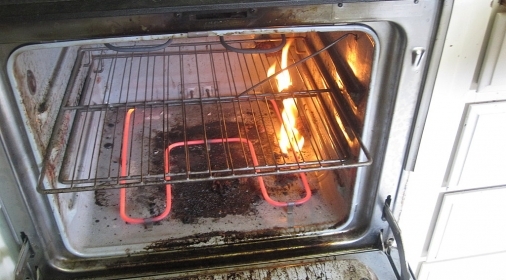 Leaving your oven and other kitchen appliances turned on could be a fire hazard or injure any pets and children if they’re left hot, so check that these are all turned off once you have finished using them in order to improve safety in the kitchen. A first aid kit is not only important for the bathroom, but you should also make sure you have one handy in the kitchen too. It should include gauze, burn salve, scissors, and the phone number for your doctors and nearby hospitals. Be careful of what you wear whilst cooking or baking. Long sleeves, hair, scarves and jewellery can catch fire or tug at pots and pans, causing them to fall off the top of the stove. 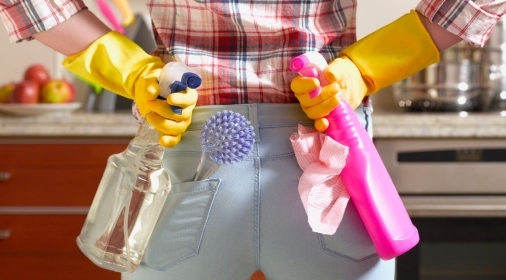 A kitchen safety tip worth remembering is to clean your kitchen with cleaner as often as possible, in order to prevent bacteria and germs from spreading. According to the fire service, you are twice as likely to have a fatal fire in your home if you don’t own a smoke alarm. The large majority of fires start in the kitchen, so don’t forget to check your smoke alarm battery regularly and replace your fire alarm once every 10 years. We hope that our kitchen safety tips will help you be more vigilant, so you can improve the safety of both you and your family. 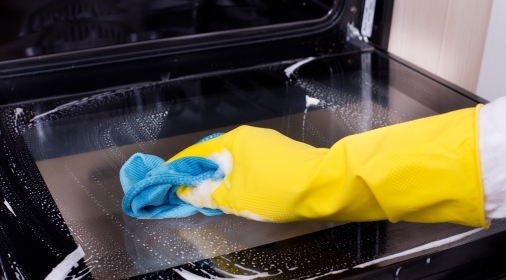 If you would like one of our specialists to clean your oven and other kitchen appliances, such as your hob, extractor hood, microwave, aga or barbecue, then call us on 0800 840 7127 or complete our online form.